Programme of music, conversations and sketches devised by John Irwin on the theme `Nothing Interests As Much As Other People'. Includes film, introduced by Peter Brook, of the recent visit to Moscow of the Phoenix Theatre with Brook's production of Hamlet with Paul Scofield in the title role. The first broadcast of a Shakespeare play on British commercial television (ITV). 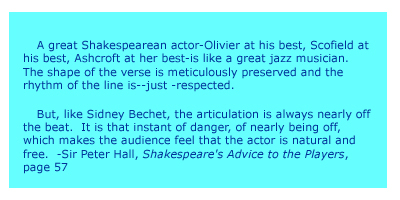 Details in Shakespeare Bulletin, v. 25, #2, Summer 2007, pages 35-37. Olwen Terris, The Forgotten Hamlet. The British Universities Film and Video Council web site has a fascinating account of how this broadcast was received by the public which you can view by clicking on this link. Cast: Paul Scofield, Mary Ure, Diana Wynyard, Alec Clunes, Ernest Thesinger, others. Forty-five minute television presentation of selected scenes from the stage musical performed at the Saville Theatre in London. Sleazy promoter Johnny (Scofield) finds a future in rock 'n' roll. Cast: Paul Scofield, Margaret Johnston, Lesley Nunnerley and Neville Jason. BBC 14/7/1959 Television adaptation of the play by Pirandello. A wealthy young Italian takes part in a historical pageant suffers a blow to the head and thinks he is Henry IV. Paul Scofield and Joy Parker reading selections of poetry and drama, including Kubla Khan by Coleridge, short poems by Walter De La Mare, and an excerpt from T. S. Eliot’s The Family Reunion. Broadcast on New York's independent WNEW-TV and Washington, D.C.'s WTTG-TV. 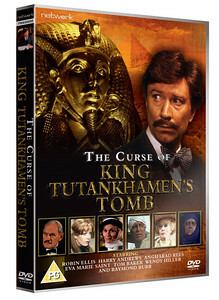 First of a 10-part series produced by David Susskind and James Fleming and funded by the Standard Oil Co. (N.J.) that presented "the greatest performers ever seen on television." More information can be found in a review that appeared in Time Magazine, (April 1962). Documentary produced to coincide with Detroit Institute of Arts World of Shakespeare exhibition in 1964. Actors reading parts offscreen are Paul Scofield, John Gielgud, Richard Burton, Albert Finney, Claire Bloom, Rex Harrison, Margaret Leighton and Trevor Howard. Newsreel footage of various dignitaries attending the 9 March performance of King Lear in Rumania. Paul Scofield thanked the audience in Rumanian. Newsreel footage. Irene Worth and Paul Scofield are interviewed regarding the Royal Shakespeare Theatre's 8-week tour of Eastern Europe. ITV special. Leading British actors perform excerpts from the following famous plays: The Master Builder, The Recruiting Officer, Romeo and Juliet, The Seagull, Ross, A Man For All Seasons, The Rivals, and My Fair Lady. Cast: Paul Scofield, Leo McKern, Laurence Olivier, Peggy Ashcroft, Judi Dench, Edith Evans, Rex Harrison, Derek Jacobi, Rachel Kempson, Sarah Miles, Peter O'Toole, Leon Sinden, Maggie Smith, Colin Blakely, others. Adaptation of a play by August Strindberg. Scofield plays Edgar, "the Captain," a man trapped in a marriage from hell. News report includes an excerpt from the film. Peter Hall is profiled in a Television documentary series. Includes a sequence in which Hall rehearses the cast of Macbeth (Paul Scofield as Macbeth) and speaks to John Barry the designer of the RSC production. Extract from the London Evening Standard Drama Awards for 1966. "Sir Winston Churchill's 'other world' of painting, presented within an historical framework of world events, with interviews, personal reminiscences and shots of the paintings themselves." Scofield won a 1969 Emmy Award as Outstanding Single Performance by an Actor in a Leading Role for his portrayal of Sir Emlyn Bowen, Q.C., a flirtatious lawyer who attempts to seduce his typist. Third play in the Alun Owen trilogy THE MALE OF THE SPECIES, a title not used in its British transmissions, but used for the trilogy's US transmission (NBC) and in later stage productions. News clip includes shots of Peter Brook working with cameraman and actors. Film clip illustrating story about the production of the Peter Brook/Paul Scofield film of King Lear. Adaptation of a play by John Osborne. Three couples, whose lives are overshadowed by a demanding film producer, escape his clutches and flee to Amsterdam for the weekend. Cast: Paul Scofield, Jill Bennett, Michael Craig, Isabel Dean. 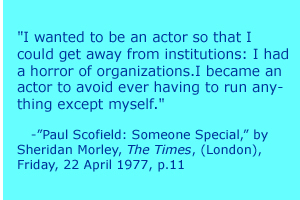 Paul Scofield discusses his film career. Scofield narrates a two-hour documentary special. An account of the International Himalayan Expedition of 1971’s disastrous attempt to climb Everest via a never-before-attempted route. The climbers assembled in Nepal and attempted to climb Mount Everest up the southwest ridge. They reached nearly 29,000 feet before being forced to turn back. Scofield plays Mr. Fennick, a con artist who gets conned. Made for TV Documentary. Celebrates record-breaking voyage of ocean racing yacht, Great Britain II with readings of Walt Whitman's poems and extracts from the writings of Conrad and others. Music: Vaughan Williams. Thames/ITV documentary made to coincide with the 60th anniversary of the Russian Revolution. Dramatization of Henry James story. Scofield plays Lewis Lambert Strether. Documentary. "Chris Bonington's K2 expedition in May 1978… includes rare footage of the American 1938 expedition and of the 1953 and 1975 attempts. "-BFI Film and TV Database. The legend of the curse retold! Scofield meets Dr. Who, Mark IV. Participants: Paul Scofield, Susannah York, Peter Cook, David Frost, Twiggy, Jean Marsh, Albert Finney, Christopher Lee, Sean Connery, James Mason, Claire Bloom, Donald Sinden, Kenneth More, Jenny Agutter, Millicent Martin, Graham Chapman. Play by Yanos Nyiri, set in Budapest in 1954. "When Karolia student, confesses his love for Ilona, a beautiful young girl from the "wrong class"-Prof. Moroi, one of Hungary's leading actors and a member of "Central Committee", decides to give one of his finest performances (Radio Times). A television adaptation of Graham Greene's metaphysical detective drama. Old Mr. Callifer is dying and his family members have come to pay respects. His son, James, (played by Scofield), is haunted by a half-remembered childhood incident that took place in the potting shed at the bottom of the garden. Rosalie Williams - Mrs Potter. Television current affairs series. Includes an item (c 9min) in which Fran Morrison reports on London's National Theatre production of Measure for Measure, directed by Michael Rudman, which is set in the Caribbean with an almost entire black cast. This is followed by a group discussion about stereotyping and the problems of discrimination in casting. Panel members include Oscar James, Ewart James Walters, Peter Straker, T-Bone Wilson, Paul Scofield, Marcia Tucker, Sir Peter Hall, and Niall Torland. The 52-minute show combined opera, ballet and entertainment. Companion piece to Noel Coward's A Song at Twilight (below). A wealthy American couple vacationing at a Swiss hotel find their neighbors all too attractive. Dramatization of a play by Noel Coward. Famous writer, Sir Hugo Latymer, (Scofield) confronts his troubled past as he considers the possibility that a former lover's affectionate overtures may be a prelude to blackmail. Scofield narrates a film about the evacuation of the remote Scottish island of St. Kilda in 1930 seen through the eyes of one of the youngsters. You can read a review of the film here. Documentary. Profile of film-maker Luis Buñuel. Scofield reads from Buñuel's autobiography. Participants include Catherine Deneuve, Fernando Rey, Jeanne Moreau, Carlos Fuentes, Jean-Claude Carriere. Central Independent Television. The first television production of the play by Harold Pinter. Based on the novel by Leo Tolstoy. Scofield plays Karenin. An very abridged version was released on video and is sometimes available on used video sites. Music composed by Irish folk musician, Donal Lunny (Moving Hearts, Planxty, Bothy Band). Play about the conflicts between a pair of elderly grandparents and their son and grand-daughter. Documentary on Richard Jeffries: journalist, novelist and nature writer. Episode 12 of the series. Christmas 1822 finds Becky and Rawdon celebrating at Queen's Crawley while the Sedleys have a very meagre feast in Fulham. Osborne's lawyer visits Amelia and offers to give young George a first class education if she agrees to give him up. Costume drama based on a novella by Leon Garfield. An apprentice in 18th century England makes a pact with a mysterious stranger to do away with Mr. Corbett (Scofield), his oppressive employer. Recipient of award. Coverage of the 35th Annual Show Business Awards presented by the Variety Club of Great Britain. Participants: Terry Wogan, Ray Moore, Lord Delfont, Gary Wilmot, Leslie Grantham, John Cleese, Cilla Black, Paul Scofield, Maureen Lipman, Maggie Smith, Mike Smith, Jill Pyrah, Elaine Paige, Michael Crawford. Anne Frank's story from the point of view of Miep Gies, a loyal friend who helped hide Anne and her family. Scofield plays Anne Frank's father, Otto. Based on the book Anne Frank Remembered by Miep Gies and Alison Gold. The Attic was filmed on location in Amsterdam. Screenwriter William Hanley won a 1988 American Emmy Award for 'Outstanding Writing in a Mini-Series or a Special' for The Attic. The film also gained six Emmy Award nominations and an American Peabody Award (1989). Documentary. Scofield narrates the evacuation of the army at Dunkirk as told through the personal accounts of survivors and archive films. Highlights of the 1990 Evening Standard Drama Awards. Participants: Ned Sherrin (presenter), Joan Collins, Alan Ayckbourn, Keith Waterhouse, Nigel Hawthorne, Richard Jones, Jonathan Pryce, Clare McIntyre, Diana Rigg, Julia McKenzie, Stephen Sondheim, Tom Conti, William Nicholson, Paul Scofield, Josette Simon, Shirley Maclaine, Richard Harris. Educational video. "Each poem is illustrated richly, and read by a well-known actor or actress." Bishop Hatto by Robert Southey; read by Paul Scofield; illustrated by Clare Buckle. Presentation of three English poems each dealing with a specific event. Beth Gelert by William Robert Spencer; read by Derek Jacobi; illustrated by Mavernie Cunningham. Documentary featuring the poet, his friends and family "accompanied by a soundtrack of the jazz Larkin loved." Episode 1: Home is so sad, 50 mins. Episode 2: What will survive is love, 60 mins. Cast: Paul Scofield - Narrator, Bernard Hepton - Philip Larkin, others. TV adaptation of Dickens' novel. Scofield plays twins: the ferile Anthony and the suspicious Martin. Young American Joanne Hunter is stranded in the German-occupied Holland with her Dutch grandparents. Scofield plays Grandpa. Scofield received best actor award for John Gabriel Borkman. Participants included Dame Diana Rigg, Sean Connerey, Jessica Lange, Richard E Grant, Dame Maggie Smith and Lynn Redgrave. Commercials. Scofield reads famous poems intended to resonate with Union Bank of Switzerland's slogan, "Here Today, Here Tomorrow." The commercials may be viewed on youtube.com. You can read about UBS' "high culture campaign" here. Three-part BBC TV series documenting the history of disabled people in the twentieth century. Scofield narrates. You can read the Guardian's review of the program here. Documentary on legendary Japanese director Akira Kurosawa, including footage from an interview with Kurosawa from an earlier BBC Arena programme and excerpts from Kurosawa's book "Something Like an Autobiography," read by Paul Scofield. Tribute. An affectionate overview of Scofield's career, including his early days with the Birmingham Repertory Theatre, his trip to Moscow to perform a history-making Hamlet in 1956, his performance in Peter Brook's stage production of King Lear in 1962, his Oscar-winning role as Thomas More in Fred Zinnemann's 1966 film, A Man for All Seasons, plus footage from the stage productions of Amadeus and John Gabriel Borkman. There's even a sound clip of Scofield singing in the West End musical Expresso Bongo. This program was shortlisted for the Grierson documentary awards, best arts documentary. Speakers: John Hurt, Vanessa Redgrave, Simon Callow, Felicity Kendal, Christopher Hampton, Michael Billington, Richard Eyre, John Harrison, Peter Brook, Donald Sinden, Peter Hall, Alex Mc Cowen, Nicholas Hytner, Eileen Atkins and Joy Parker Scofield.